My comment policy is based on the policies at BlagHag and Why Evolution is True. Your first comment will sit in moderation until I get a chance to look at it. That is a pretty common policy across the internets. Be patient. I’m not always in front of the computer. Spam – As of August 2012, I have only had just under five thousand spam comments, which have been caught by Askimet and a few dozen more that fell into my comment moderation folder. If you want to say you like a post, you can, but I can’t guarantee that it will make it past the spam folder unless you include some context. Hateful, abusive, or threatening – If you have an argument to make, do so without bigotry, abuse or threats. Referring to public figures as idiots or with polite crudeness is fine. Insulting other commenters will not advance your position. If I ask you to apologize, please do so. If you don’t, you won’t be welcomed back. Threats are illegal and will be reported as needed. Trolling or thread derailing. – Nobody likes trolls. If you want to discuss something different from what is being discussed, starting your own blog is quite easy. Evangelizing or posting quotes or verses without explanation – Does this mean that people expressing religious beliefs will find their comments unwelcome? Obviously not. But if you post a string of verses from your personal holy book without commentary, you will find your comment deleted. Express yourself, show that you can pass the Turing Test, and I’ll likely even respond. If asked for scientific evidence, don’t respond with a verse. Posting other people’s work without attribution – This is just common courtesy. If you want to quote somebody, quote them. If I am taking the time to write a reply, it is simply rude to respond by copying and pasting material from somewhere else. If you post a link that you believe supports your position, I’ll try to take a look at it, providing that I have the time. I can’t make a promise to do so. If I respond with a link to talkorigins.org or Skeptical Science, do yourself a favor and read what I have linked to. I do this because I could restate what has already been brilliantly written by somebody else, or I can just point in that direction. If you have a topic that you would like me to write about, feel free to tell make a suggestion. If you don’t like what I wrote about, there is an entire internet out there and I’m sure that somebody has written something that you will enjoy. If you don’t like blogs that mention cats, don’t read the posts about cats. If there is a youtube video you want to share, just post the link. Embedding a video takes up bandwidth, and can slow down loading speeds. I know I can be pretty longwinded sometimes, but I try to be clear and concise. Please do the same. Please feel free to de-lurk and leave a comment. If you don’t understand something that I have written, ask. There is a good chance that somebody else would benefit from the clarification. When you post, I would appreciate it if you use your real name, or at least the pseudonym that you use most often when online. There are good reasons for anonymity, but if I am willing to use my real name, I would appreciate the same. Please use your real email address. I won’t disclose it without your permission, but if there is a problem with the HTML in your comment, I may need to contact you. If I really like what you write, I may want to contact you in order to ask you to write a guest post. 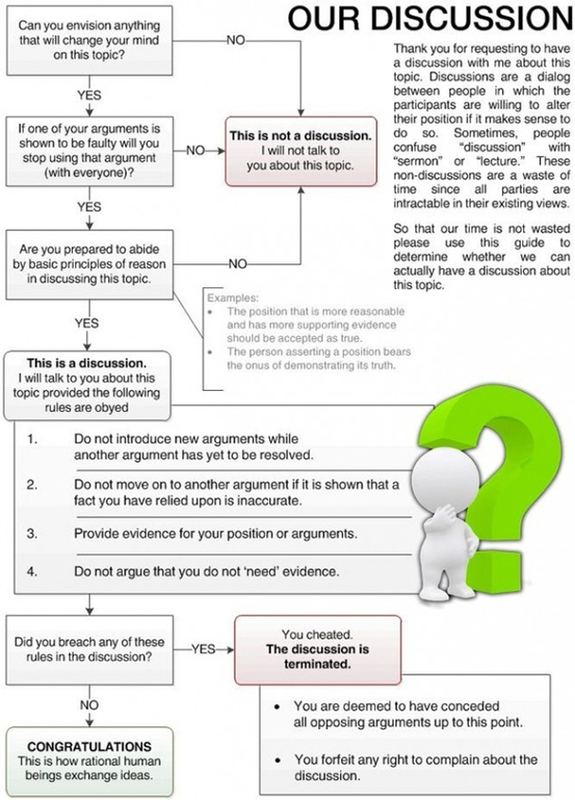 If you cannot manage to follow this flowchart on how to have a discussion, you probably should try again.